Ballet appears dainty and harmless to those on the outside looking in, but those who have endured the bruises, exhaustion, and snapped tendons that come along with it will gladly voice to the contrary. Black Swan, Darren Aronofsky's latest mind-meddler, dips into this raw and painful side to conjure a rush of psycho-sexual tension and artistic meditation, funneling a dancer's fear of career-ending transience into a descent towards mania. But the film doesn't stop with the physical; dashes of traditional horror reaching back to Dario Argento's Giallo films and even a heap of David Cronenberg mingle with the unspooling of a young artist's mind, coming as close to a visual embodiment of "transcendence" for art's sake as one can get. We witness the metamorphosis of a woman on-screen, both as a dancer and as a girl losing her inhibition, and it's relentlessly unsettling -- and utterly mesmerizing -- by way of the director's intellectually aggressive style. After waking from a odd-yet-satisfying dream where she's dancing in a dark spin on Swan Lake, Nina (Natalie Portman, V for Vendetta) twists her ankles and feet in a few circles, letting the creaks echo in her kitschy little bedroom. She's a weathered dancer with a major ballet company, living in an underwhelming apartment with her intrusive mother (Barbara Hershey, Hannah and Her Sisters) coddling her between daily rehearsals. Nina's always been meek around her colleagues, especially company director Thomas (Vincent Cassel, Irreversible), and it's transformed her career into that of an accomplished supporting player with little more to show for it than promises for more of the spotlight. 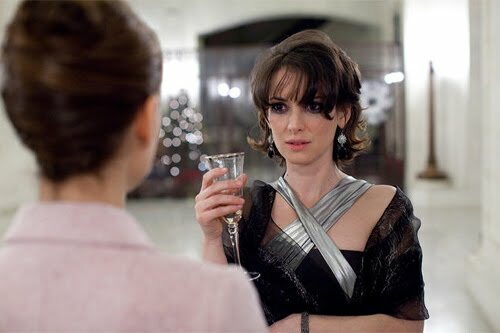 She's always a key secondary character in Swan Lake, yet she hasn't stood out enough to earn the role of Swan Queen, a part routinely given to soon-to-be-retired veteran Beth (Winona Ryder, Girl, Interrupted). More importantly, she hasn't broken out of her shell nearly enough to embody the duality of the Swan Queen's role in her dancing -- first delicate and warm, then brooding and incendiary. While Nina steps up her game both on and off the stage, a dark-haired, tattooed newcomer, Lilly (Mila Kunis, Forgetting Sarah Marshall), seductively slips into the competition. And Nina, who's anxious to tweak her personality for the role, takes close notice. The eeriness generated in Black Swan's opening dream sequence lingers long after its fleeting time on-screen, suggesting something sinister coursing underneath the film's abrasive trimmings. But Aronofsky, similarly to his rough-and-tumble drama The Wrestler, first focuses on the exchanges between Nina's colleagues in the ballet world -- here, mostly one-upmanship cattiness -- and some vicarious maternal drama for its foundation, etching out a portrait of New York-bound performance competitiveness within its brash, electric setting. He illustrates the extent of Nina's personality within this maze of slate-colored hallways and stony dance studios, and how she differs from her colleagues; she lacks gumption and composure, even though her talent soars above those around her. In that, the edgy screenplay pivots around her quirks, from the nervous scratching that reddens her shoulder to her compulsory need to vomit upon the slightest flutter of stress. She lacks joie de vivre, and she knows it. Aronofsky returns to mainstay cinematographer Matthew Libatique (Everything is Illuminated) to capture Black Swan's cold, rasping surroundings, yet it's interesting how similar the earthy visual tempo resembles that of Maryse Alberti's work on The Wrestler. As we peer over Nina's oft-itched shoulder and slender neck, it feels as if we're seeing -- and feeling -- the world about her in a grounded and effortless fashion, the verbal digs and weighty pressure closing in. Clint Mansell's (Moon) score, reflecting on tones in Tchaikovsky's work with his own searing percussion, adds to the flush of tension that swallows up Nina; his work on Black Swan differs from his momentum-driven, piano-and-string-heavy odes, more delicate and subtly haunting than he's expressed previously. This trio of filmmakers has concocted many a stunning picture together, ranging from Requiem for a Dream's severity to The Fountain's existential allure, yet the frosty and sleek aesthetics in Black Swan merge into what's arguably their most polished collaboration to date. As a film about performance art's erratic moving pieces should be, it's an insatiable onslaught on the senses that thrives off of leaving its audience boggled and entranced to equal measure. As Nina's nervous spasms intensify with her preparation for the role of the Swan Queen, specifically the darker and more seductive half of the part, Black Swan descends into a stark and disturbing portrait of envy, emulation, and the madness that follows obsession. Aronofsky guides Nina's anxiety through a thick cloud of ambiguity over its realism, allowing the spine-chilling opening dream sequence to ignite a series of intensifying supernatural twitches that may, or may not, be the workings of an artist slowly losing her sanity. Is the rash on her back the work of a childhood habit whenever Nina gets nervous, or is it the potential exit point for a pair of wings? Aronofsky paints a searing portrait for his audience that profusely teases an answer, which, along with a peppering of impressively seamless visual effects, turns this into the director's first real tango with traditional horror. Yet this isn't about us as her audience; it's about Nina's rush to crack her outer shell, while we're just allowed to witness the grueling scope of her manic transformation. The most important character in Aronofsky's film, as a result, is the labyrinth of Nina's mind, both in how she sees the world spiraling around her and how she adapts to the duality demanded for the darker, sultry Black Swan. 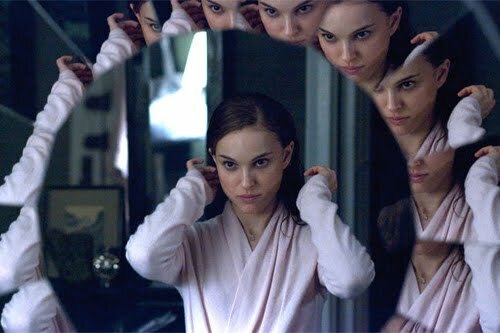 The madness that she undergoes ravishes the screen due to a pinnacle performance from Natalie Portman, both in acting and dancing capability. Aside from lengthy pirouettes and vigorous en pointe work, which will be obvious, it's Portman in the ballet slippers, trimmed to a svelte frame and edgy with her somewhat frantically-determined disposition. With the rivalry intensifying and the physical demands whittling Nina down thinner, Portman pumps up her fatigued, hotheaded edginess to match the chaos around her. She's complimented well by Vincent Cassel as company instructor Thomas, who aptly embodies both the brilliant and coarse sides of a director. There's a particularly involving scene where he demonstrates the consuming rush of seduction for -- actually, with -- Nina, and it ignites a bit of a stir on both physical and mental planes. Then, there's Mila Kunis, who impressed earlier this year in The Book of Eli. There's an edge to her performance as Lilly that will take insight to see, perhaps a second screening. However, when the two-faced fabric of Lilly's demeanor comes into light, it's obvious that Kunis' emerging talent claims a lot of the responsibility for the deft rendering of the film's concept. As an effortless dancer who pops pills and beds men at her whim, Lilly becomes something of an inspiration to Nina -- but obviously not just in the dancing arena. She becomes a benchmark for everything that Nina isn't, a goal to obtain and, in ways, the yin to her yang. Portman and Kunis share the ideal chemistry for their places in the narrative, off-and-on distanced and clingy, which builds to a ravishing ... erm, "climax" in their relationship that matches steaminess beat-for-beat with meaningfulness to the script's grand design. The macabre allure in Black Swan builds into a cerebral puzzle splintered within an intellectual concept, showing the extent that slaves to art endure within this fantastical, oftentimes horrifying depiction of creative abandon. As the final act spins into a nightmarish whirling dervish, furiously constructing an answer to the film's ambiguous question, its attempt to both knock us off-kilter and rope us into significance rattles the senses all the way to the big performance -- a stripped-down, disquieting take of Tchaikovsky's work. And, boy, does Aronofsky succeed. It's possible that Black Swan's stroke of meaning might be lost on those that haven't known artists who desperately chase their craft, be it stage performers or method actors or even sketch-and-paint artists. Most, however, can appreciate the magnetic pull towards accomplishment that's achieved through diligence and zeal, which takes on a deeper meaning in artists. They must live and breathe their art form for it to feel real to their audience, and Aronofsky has created an intricate, engaging and ominous display of the transcendent process.